Are the Night Doctors coming for you? 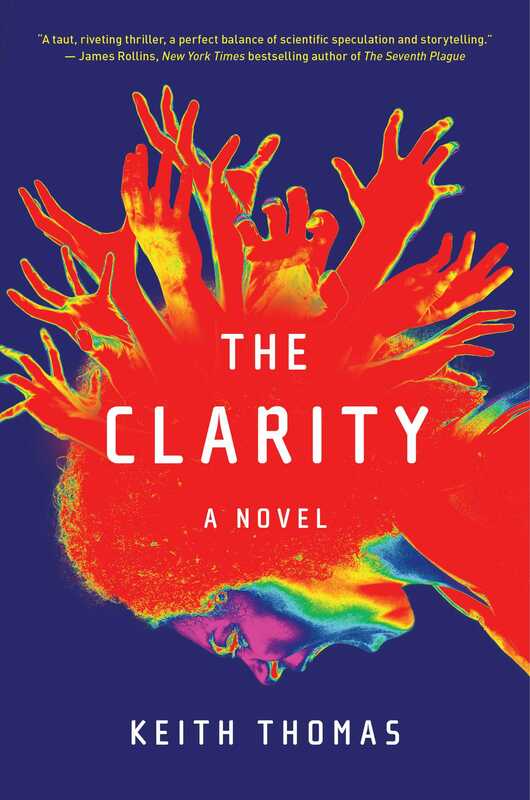 Fast-paced and suspenseful, The Clarity is a chilling blend of science and danger—a compelling take on the possibilities of reincarnation and life after death. THE WORLD IS a wasteland. And Private George Edwin Ellison is on patrol. Fingers numb, body battered, he pushes his way through a blackened field that was once a school yard. The wind is fierce. He pulls up the collar on his jacket to block it out but it finds the holes, the tears, and worries at his skin the way the biting gnats did on the rust-colored banks of a nameless Belgian canal. Bites he still scratches; bites he suspects will never heal. George counts his steps, a time-killing habit. A distraction. Each footfall a crunch on ruined earth. A solitary beat in the nothingness. Behind the village school building, he finds the charred body of a horse. Its forelegs fused with the blackened pile of the school’s chimney. Beelzebub’s chariot, he thinks with a chuckle before moving on. He’s seen worse. Smelled worse. Truth is, he’s been lucky. It is day 1,566 of the war to end all wars and he still walks, still has the use of his hands, and the ability to remember home. Not like Richards from A Company. Not like the limbless American he found in an alfalfa field. The war was supposed to be the last spasm of hatred, the last night before a dawn of reason. Only instead of a spasm, it’d become a cancer. Surely, the world couldn’t handle another day. As he counts out his steps, George thinks he hears the chanting of the villagers who’d welcomed them into the devastated hamlet. But likely it is just the ceaseless rush of the wind through the naked trees. George rounds the school building and waves the all clear to the rest of his platoon. As they move toward the canal, he picks up his step. The cold has seeped into his bones, and he recalls fondly how he warmed his fingers beside an oil-drum fire that morning. He wishes he could hold that heat like water, rub it like a salve on the numbness overtaking his body. Thinking of the fire conjures up images of home and of his grandmother’s butter tarts. He sees his son, James, smiling as he waves goodbye in the doorway of their Edmund Street house. And he sees his wife, Hannah, on the night before he’d left: her cherubic face glowing over their last rationed candle, tears sparkling on her cheeks. George had carved her image on the back of his pocket watch. A smiling, cherubic face done in a simple, amateurish style. Folded and worn, the watch has survived the worst of Ypres, Loos, and Cambrai; a scrap of metal that dodged bullets and survived mortar rounds. George knows that bodies are the weakest link. He’s watched so many men die. So many men suffer. Yet he is still here. Still marching, still counting out steps. Sensing his brief surge in optimism, the exhausted sky breaks open further and lets loose a deluge. George slows, head hung low under the battery of cold rain. Behind him, the platoon falls into formation. The guys who have faith—the ones who believe in something more than mud, fog, rain, and fire—they follow closely. For them, George is the lucky one. Their rabbit's foot. Their dream catcher. He is the one who always keeps walking, pushing forward ceaselessly, on automatic, when they all would gladly crumble. Sixty-five feet from the canal, Major Ross halts the Fifth Royal Irish Lancers’ approach. In the middle of the road, rain spattering their faces, George kneels down in the muck beside Private Frank Price. George points to several cottages across the canal. With three machine gunners in tow, they cross the bridge. Every step across the bridge is slicker than the last, and the water churns beneath them, festooned with tree limbs, trash, and the bloated bodies of what once were sheep. On the other side, they approach the house carefully, each holding his breath, each as close to George as they can possibly be. Reaching the first house, the machine gunners push their way through a broken door to the dark interior. One of the gunners, Robinson, shouts out a warning, “Ne tirez pas! Ne tirez pas!” Robinson has shouted the phrase in every village, every town. Even though they all knew the French rarely had weapons, it had become Robinson’s mantra, his way of staying sane. In the kitchen they find three elderly Belgian men with broken smiles and blackened hands. George checks the back room, while Frank and the gunners talk to the old men. There are Germans near, the old men say. Just outside. That’s when the roof comes apart. At first George thinks it is a building collapse. He ducks down, ready for the spine-breaking timbers to hit, but when they don’t, when all that falls is a fine mist of brick dust, he knows they are under fire. An angry buzzing comes next, as slugs careen around the house, ricocheting off the walls. Dodging bullets, ducking low, George scrambles into the kitchen, where the gunners fire through the windows. Frank drags George out a side door and, crouched low, the rain suddenly renewing its attack on their already drenched clothes, they zigzag to a low brick wall at the rear of the house. The narrow cobbled streets look clear, the houses around them empty. George points to a hill three hundred feet to the north. There, a German machine gunner reloads his Maschinengewehr. George looks down at his pocket watch to see that the hands have stopped. He’s confused; he’d just recently wound the watch. It should be working. But he is even more confused by the tiny red droplets that lie in a line on the glass surface of the watch, like red rain as crimson as blood. The time is stuck at 10:55 a.m.
George hears the clatter of gunfire but it is a world away. Like thunder a few villages over. It doesn’t last long. He turns to see Price hit the muddy earth, a bloom of mud and debris flying overhead. And then George falls backward, only very slowly. The watch in his hand remains as still as its arms. The rain has stopped. The air thick, heavy like a blanket. A heartbeat later and George finds himself staring up at the sky. Robinson leans over him with a look of terror. It is 9:29 a.m. and the numbness starts to move across George’s body. It crawls from his fingers, up his arms, and from his toes to his thighs. It is not the stinging numbness of the cold. Not the impersonal numbness of the rain. It is like falling asleep. Like being a child, sinking into a place of enveloping comfort. It is like falling asleep with Hannah in his arms. With that thought, George’s breathing slows. And an overwhelming, almost suffocating peace comes over him. George hears distorted shouting. More of the guys in his platoon appear; they stand over him, helmets off. Robinson leans down again, close to George’s face. It is 9:30 a.m. and George Edwin Ellison is dead. The very last British casualty of the First World War. The rabbit foot, the dream catcher—his luck has run out. And as George’s body settles into death, his pupils dilate, becoming two black pools that widen until they consume the whole world. All that is left is darkness. And in that darkness, a small voice screams. Keith Thomas worked as a lead clinical researcher at the University of Colorado Denver School of Medicine and National Jewish Health before writing for film and television. He has collaborated with James Patterson on a screenplay and a novel. His work has also appeared in Geek and McSweeney’s.